The “space race” between the Soviet Union and the United States was in full swing. I was four years old when my father took me outside on a dark Arizona night in October 1957, to peer upward in hopes of catching a glimpse of the first manmade object to orbit the Earth—Russia’s Sputnik 1. Sure enough, it streaked across the heavens as a pinpoint of light. By April of 1961, Russian cosmonaut Yuri Gagarin became the first human to travel into space aboard Vostok 1. Peering through the window of his spacecraft, Gagarin was reported to have made the comment, “I don’t see any God up here” (“Yuri Gagarin...,” n.d.). [NOTE: Yuri’s colleague and good friend, Colonel Valentin Petrov, later insisted that Yuri never made such a statement, though it came to be attributed to him, but was actually the result of a comment by Russian Premiere Nikita Khrushchev in an anti-religious propaganda speech before the Central Committee of the Soviet Communist Party: “At that time Khrushchev gave all the Party and Komsomol organizations the task to promote this propaganda and said: ‘Why should you clutch at God? Look, Gagarin flew in space and saw no God’” (“Gagarin Never Said...,” 2006).] Russian astronaut Valery Bykovsky told newsmen in 1963 that no Soviet cosmonaut believed in God and none of them had seen anything to change their minds during their space flights (“Soviet Cosmonauts...,” 1963, p. D7, emp. added). At the time, the spiritual and religious sensibilities of most Americans were shocked by such blatant, unmitigated unbelief. 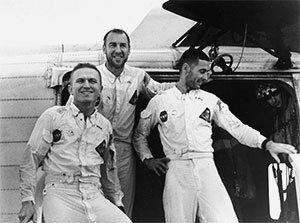 December 24, 1968 when Apollo 8 entered lunar orbit on the first manned mission to the Moon. Before retiring that evening, the astronauts did a live television broadcast to Earth, showing pictures of the Earth and Moon seen from their space capsule. They concluded the broadcast in the following fashion. Lunar Module Pilot William Anders said: “For all the people on Earth the crew of Apollo 8 has a message we would like to send you.” He then began reading from the Bible, specifically Genesis 1:1-4. Command Module Pilot Jim Lovell then continued the reading with Genesis 1:5-8. Finally, Commander Frank Borman completed the reading with Genesis 1:9-10, and then closed the broadcast with the words, “And from the crew of Apollo 8, we close with good night, good luck, a Merry Christmas, and God bless all of you—all of you on the good Earth” (Williams, 2007). 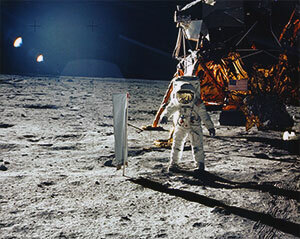 Seven months later, on July 20, 1969, with the largest worldwide television audience in history watching, Buzz Aldrin and Neil Armstrong became the first two humans to visit another world when they stepped onto the Moon from their Apollo 11 Lunar Module Eagle. Since the infamous atheist Madalyn Murray O’Hair had filed suit against NASA (a suit eventually rejected by the courts) due to the Apollo 8 crew reading from Genesis, Aldrin was asked to forego his plan to read publicly from the Bible while on the Moon’s surface. Nevertheless, while still on the Moon, he radioed to Earth the following: “Houston. This is Eagle, the LM Pilot speaking. I would like to request a few moments of silence. Over. I would like to invite each person listening in, wherever and whomever he may be, to contemplate for a moment the events of the past few hours and to give thanks in his own individual way” (“Apollo 11 Astronaut...,” 2007). While still on the Moon, Aldrin read John 15:5 to himself and then observed the Lord’s Supper (2007). During a television broadcast by the astronauts the evening before splashdown, Aldrin quoted Psalm 8:3-4—“When I consider thy heavens, the work of thy fingers, the moon and the stars, which thou has ordained; What is man that thou art mindful of him? And the Son of Man, that thou visitest Him?” (2007). Two years later, astronaut James B. Irwin walked on the moon during the Apollo 15 mission in July 1971. Concerning that lunar mission, Irwin declared, “I felt the power of God as I’d never felt it before” (Wilford, 1991). At the end of the first day of exploring the rugged lunar highlands, Irwin said he was reminded of “my favorite Biblical passage from Psalms,” which he then quoted by radio to Mission Control in Houston: “I’ll look unto the hills from whence cometh my help” (Wilford). Of course, America’s brave astronauts merely reflected the religious convictions shared by the bulk of American culture at the time—extending all the way back to the beginning of the country. Tragically, that spiritual conviction, so characteristic of American civilization then, has since experienced extensive erosion. Contrast the astronauts in the early days of America’s space program with more recent ones. Returning from a 16-day mission in March 2008, crew members of Endeavor stated that as space exploration forges ahead, they believed the human race will find life elsewhere in the Universe (“Astronauts Say...,” 2008). Mike Foreman, a mission specialist on the Endeavor, said, “If we push back boundaries far enough, I’m sure eventually we’ll find something out there” (“Astronauts Say...”). Such thinking is typical of evolutionists who must look elsewhere for their faltering theory of evolution (cf. Richard Dawkins in Expelled; Stein and Miller, 2008). Foreman continued: “Maybe not as evolved as we are, but it’s hard to believe that there is not life somewhere else in this great universe” (“Astronauts Say...”). “Apollo 11 Astronaut Buzz Aldrin’s Notes on Handwritten Card Offered by Auction House” (2007), International Herald Tribune, September 19, [On-line], URL: http://www.iht.com/articles/ap/2007/09/19/america/NA-GEN-US-Astronaut -Auction.php. “Astronauts Say There Must Be Life in Space” (2008), Space Daily, May 12, [On-line], URL: http://www.spacedaily.com/2006/080512063010.m60tu6xh.html. “Gagarin Never Said He Did Not See God in Space—His Friend, An Air Force Colonel” (2006), Interfax, April 12, [On-line], URL: http://www.interfax-religion.ru/orthodoxy/?act=interview&div=73 &domain=1. “Soviet Cosmonauts Called Unbelievers” (1963), The Washington Post, p. D7, December 11, [On-line], URL: http://pqasb.pqarchiver.com/washingtonpost_historical/access/179980282 .html?dids=179980282:179980282&FMT=ABS&FMTS=ABS:FT&date= DEC+11%2C+1963&author=&pub=The+Washington+Post&desc=Soviet +Cosmonauts+Called+Unbelievers&pqatl=google. Wilford, John N. (1991), “James B. Irwin, 61, Ex-Astronaut; Founded Religious Organization,” The New York Times, August 10, [On-line], URL: http://query.nytimes.com/gst/fullpage.html?res=9D0CE3DD173DF933A2575B C0A967958260. Williams, David (2007), “The Apollo Christmas Eve Broadcast,” NASA Goddard Space Flight Center, [On-line], URL: http://nssdc.gsfc.nasa.gov/planetary/lunar/apollo8_xmas.html. “Yuri Gagarin Biography” (no date), Biography Base, [On-line], URL: http://www.biographybase.com/biography/Gagarin_Yuri.html.